I have learnt to animate decently in 2d. What I mean by that is I can see and track movement well. But drawing the figure in perspective is another whole thing. So, for a 3d character design I am coming up with I wanted my sketches to be as close to scale as possible from all views. I started out by first thinking who I wanted my character to be. I came up with some descriptions. – Happy, relaxed, cool, slightly dumb, around 30 years of age, very expressive. I now tried drawing some full body poses. All these poses were very gestural. While I was doing these, I kept trying to think of his face and drew a blank. I could just continue drawing the body without having a face in mind. So I tried drawing a few faces and soon realized I knew very little about facial anatomy. I stopped what I was doing and started looking at models created by others. Feature films, short films, student films, stylized characters and things that looked remotely like characters… basically many examples to draw inspirations from. I liked one particular style of characters. A combination of hard edged and smooth models. Keeping this in mind, I designed the character below. This guy looks good from a 2d perspective, but I was having a tough time figuring him out volumetrically. 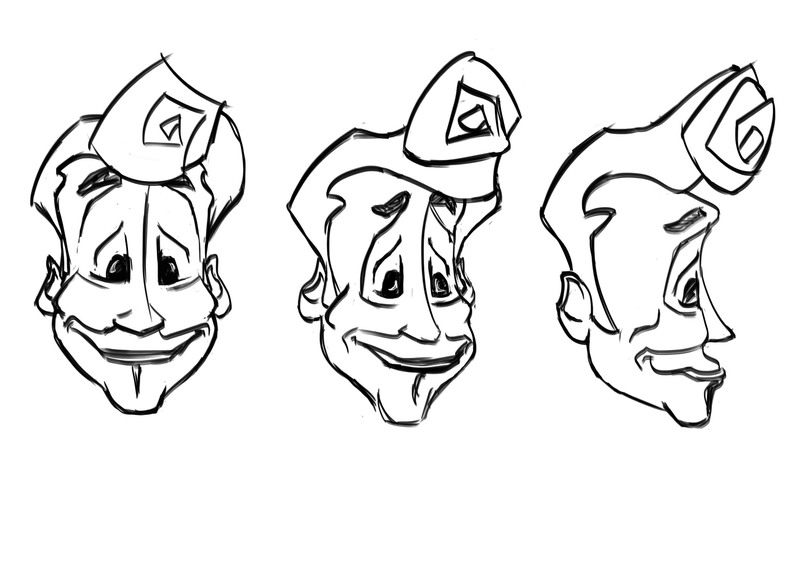 So, I redrew his face with basic building blocks to understand the facial topology. Now that I had a face planned out, I went ahead with designing his body. I wanted this guy to be very dynamic. I imagined him to have deforming bones. What I mean by that is if he is moving his hands fast, then the bone on his arm would bend slightly, as though lagging behind. I thought this would make for an interesting animation. 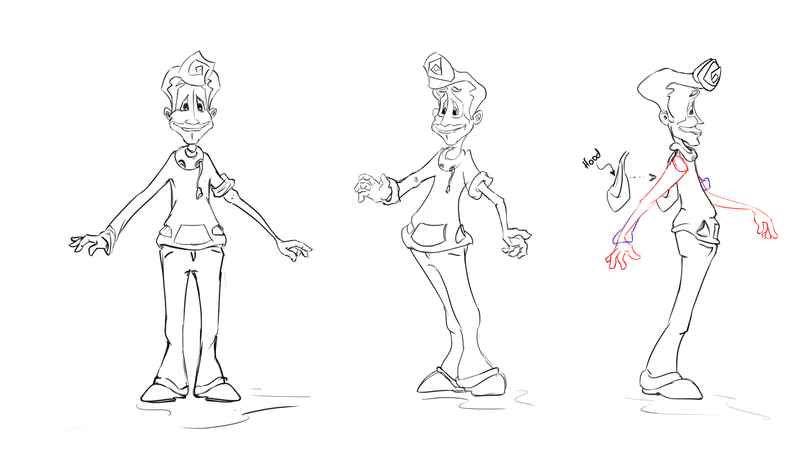 So, I designed the character in poses with slightly bent arms. I have a turn around of him. Comments are welcome. 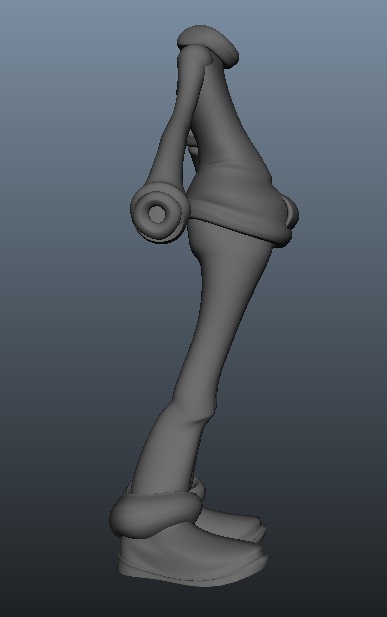 I then proceeded to model him. This is my first ever model in NURBS. I played around with the basic NURBS shapes to understand how they worked. And I am very confused even now. I have not figured out how to attach the simplest of shapes together. 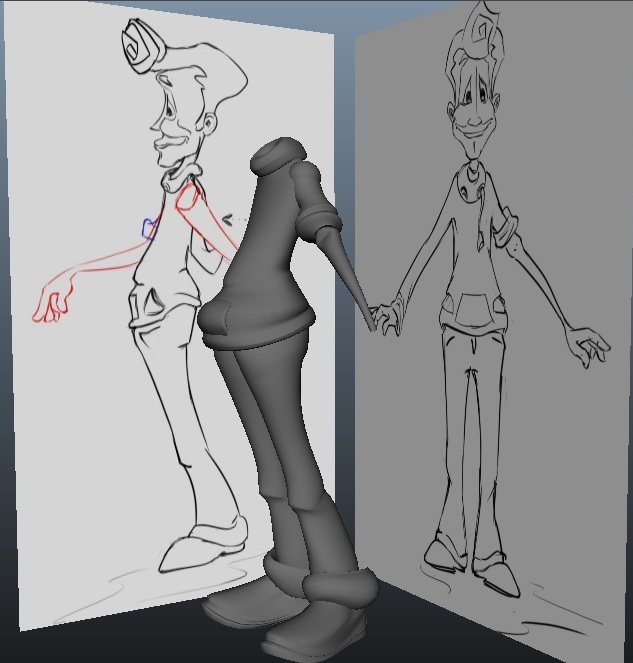 In parallel, I started modeling my character in NURBS. I have not attached any of the body parts together. I have left that for the final tweaks. 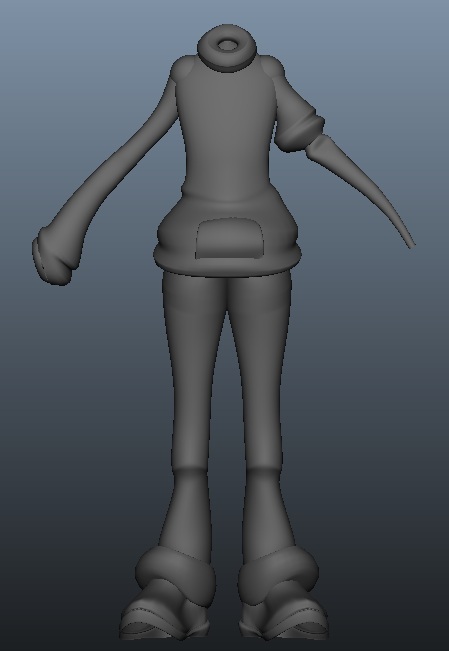 Right now i am focusing on getting a nice, clean and low mesh topology. Here is what I have till now. More when I have made more progress.